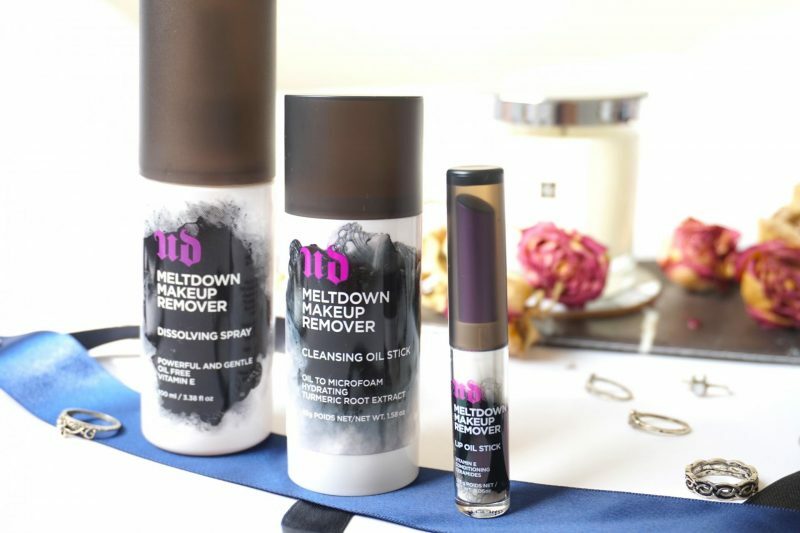 Today I will talk about the new Urban Decay Meltdown Makeup Remover items! I received these items from UD them self which is such an honor, thank you. 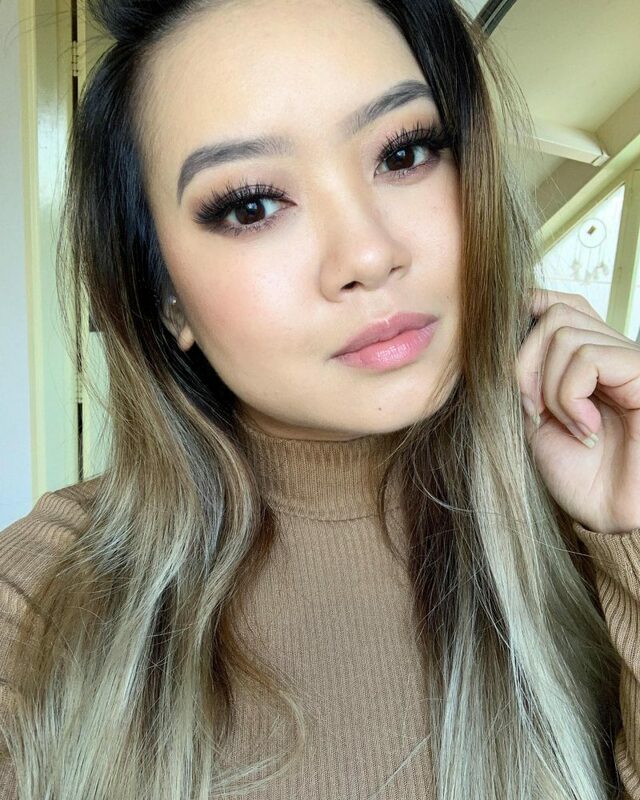 I think they knew from the beginning that me and skincare is a better match than me and makeup looks (because I’m a makeup lover, not a makeup artist!). 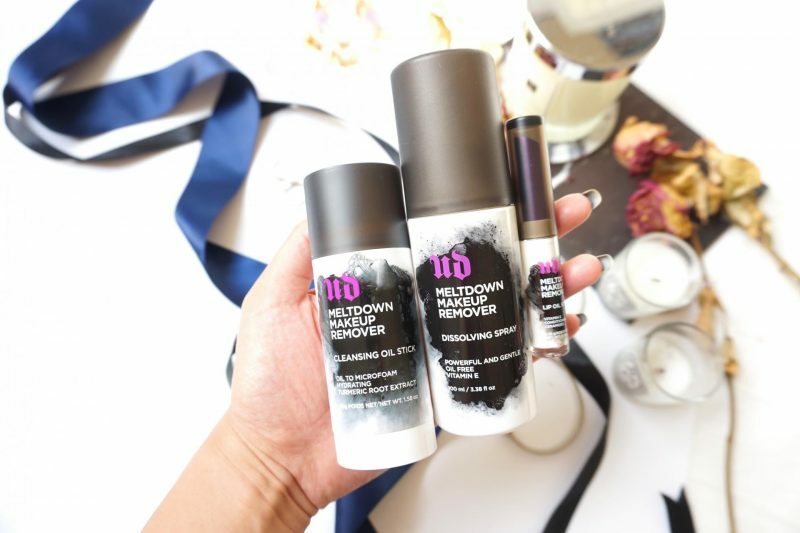 I never heard of the Meltdown Makeup Remover collection until I received these items. UD has been one of my favorite makeup brands since I got their Naked 2 Palette back in the days. From that moment I collected a few lipsticks and concealers from them. 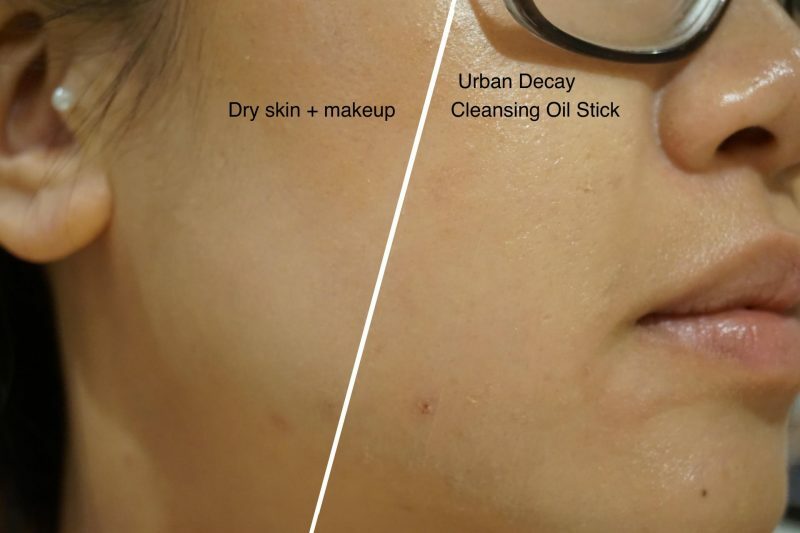 Now UD has launched the Dissolving Spray, Cleansing To Oil Stick and the Lip Oil Stick to remove that super long-lasting makeup from your pretty face! 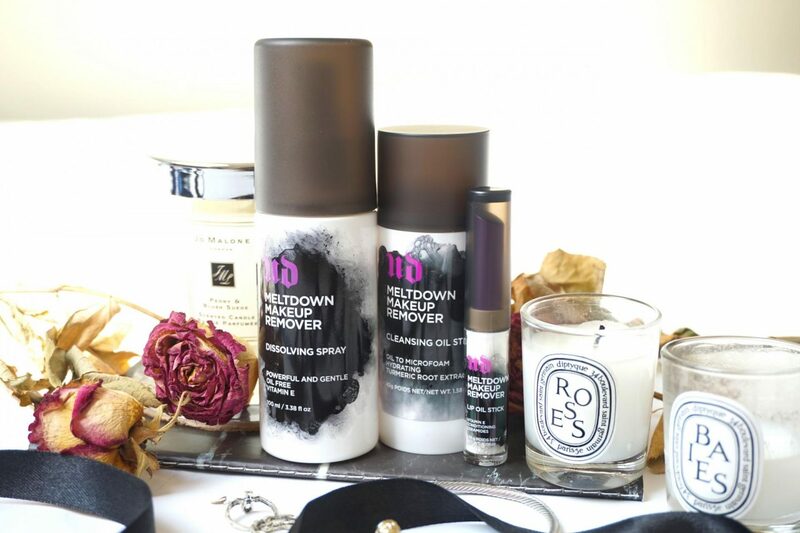 We always want our makeup to last forever, but how do you take them of in an easy and fast way? Let’s get started! 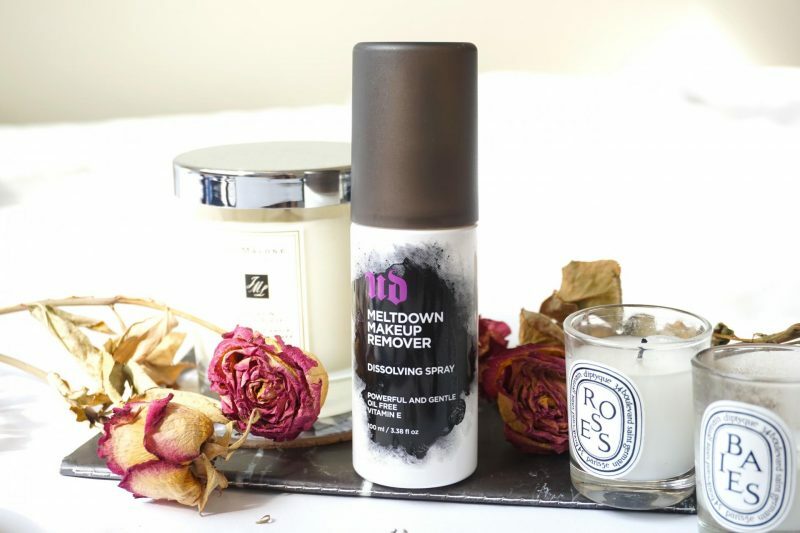 Meltdown Makeup Remover Dissolving Spray mists on weightlessly and starts working on contact to instantly dissolve our long-lasting products in one swipe—no rubbing or tugging on delicate skin. Wait until you see how well this spray works; it easily takes everything off, including waterproof mascara. Our super-effective, anhydrous, filler-free formula contains only three ingredients, including conditioning vitamin E.
When I just received this product I thought it was like a micellair water: just apply it with a cotton pad and your makeup is gone! It kinda works the same as a micellair water because it is just one step to remove all the makeup without washing off your face. Great to know that this cleanser is produces with only three ingredients. Lately I see some products with a whole list of ingredients and it sometimes makes me nervous to try it out. Or am I the only one? This was something I was soooo excited about! Me, balm, cleanser, melting from balm to liquid .. sounds like music to my ears! I’ve been a big fan of balm cleaners because I adore the feeling of how the balm melts on my skin and the relaxing feeling when you massage it on the skin. The cleansing balm I own are contained in a jar so this is my first stick. Super curious if this makes the experience more fun but on the other side it sounds less hygienic because you will use the stick directly on a dirty skin. When UD developed Vice Liquid Lipstick, we loved the insane wear, but we were having a terrible time getting all of the color off our lips! 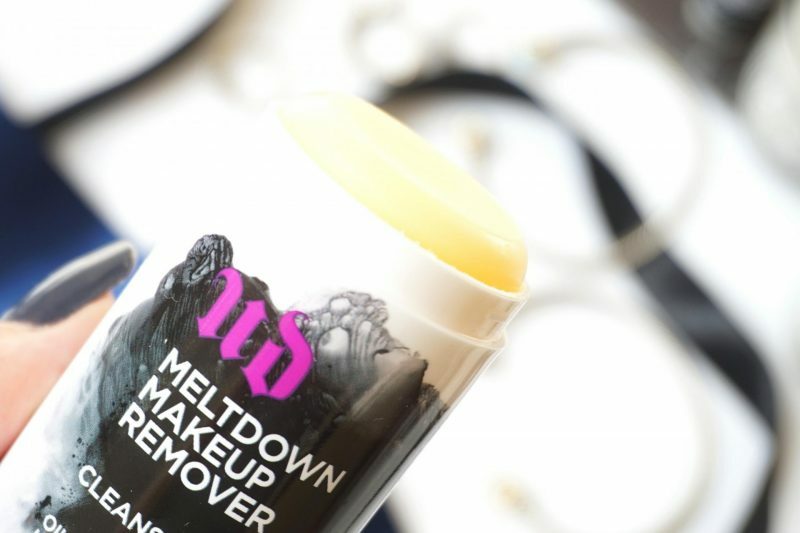 So they created a product powerful enough to do the job: Meltdown Lip Oil Stick. Take off one Vice and get ready for the next. 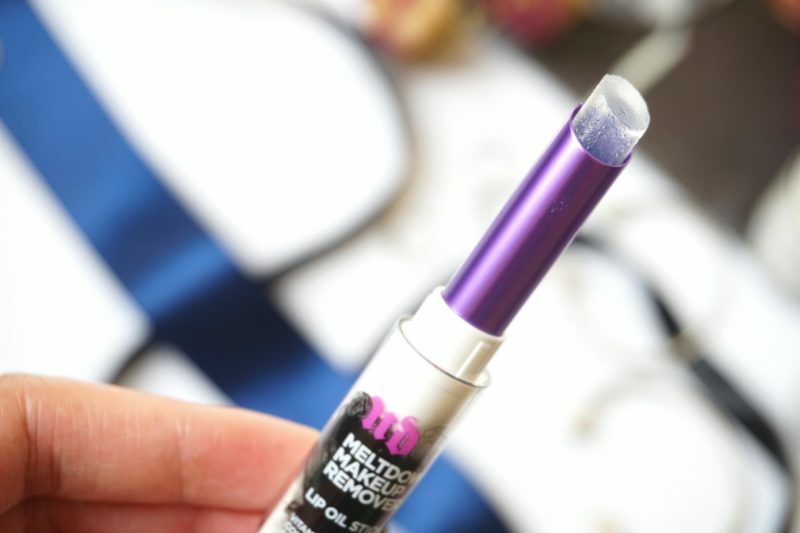 This lightweight, silky stick glides on to remove our longest-lasting lip products. Our oil-based formula helps break down waterproof lipstick easily. And because we used a gelled oil system, the feel is silky, not oily. Our conditioning, wax-free formula contains vitamin E and ceramides to replenish lips. 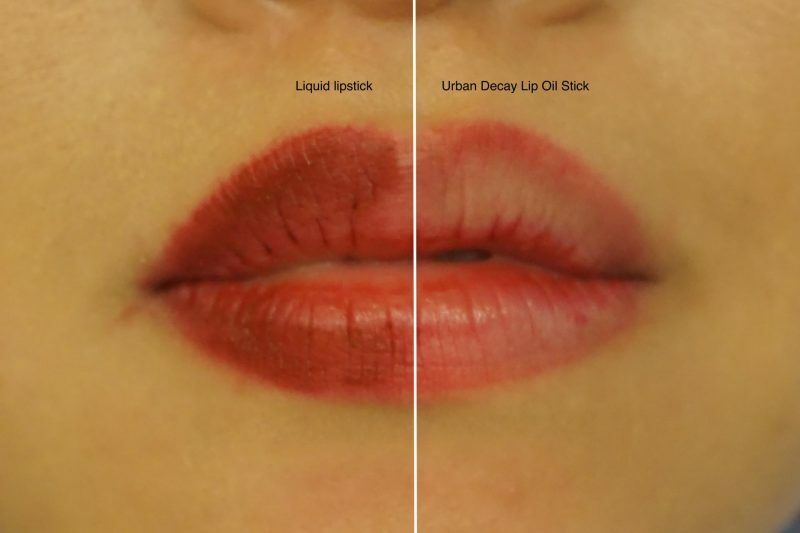 Lip Oil Stick is so moisturizing you can even use it as a balm! 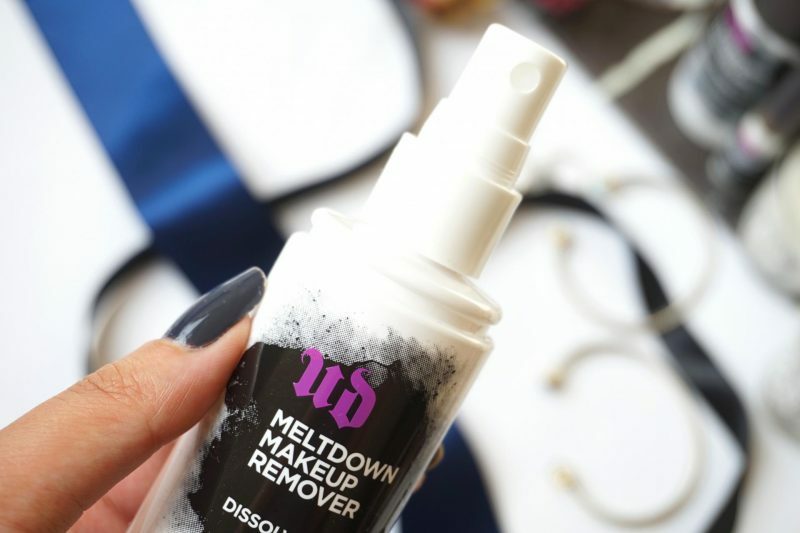 This is not only for the UD Vice Liquid lipsticks lovers out there, but also for our liptint and lipoil addicted people who struggle to remove their lip product. 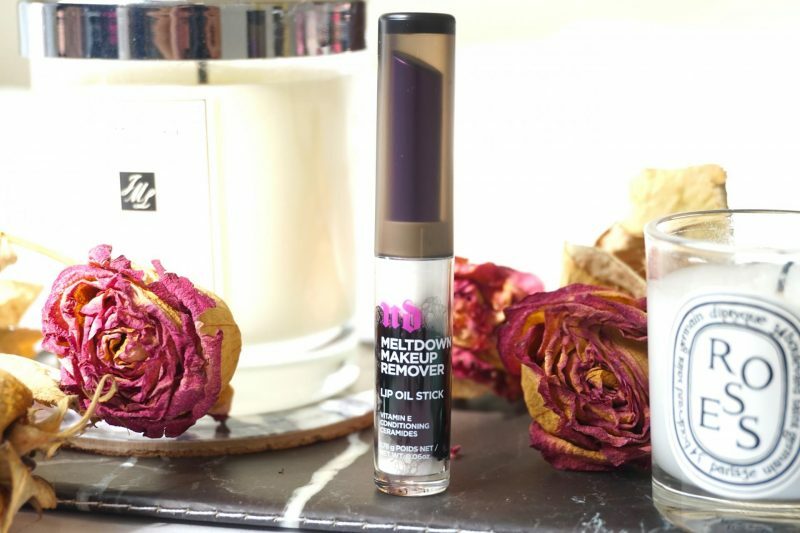 This oil stick will remove everything applied to your lips, no matter if it is fresh liquid lipstick or 4 layers of matte lipstick re-applied throughout the day: this lip oil is the solution. The Dissolving Spray packaging is like you expected a spray. Very easy to use. I prefer spraying it on a cotton pad and swipe it all over my face. You can also spray it directly on the skin and use a tissue to wipe it off. Everything is possible with this spray but there is no water needed in this routine! I use about 4/5 sprays on my cotton pad when I swipe it along my face. The first thing that I noticed was the neutral fragrance which is not a surprise because it only has three ingredients. When I used the cotton pad on my face I felt a wet, oily layer on my face. I did see that the makeup was on the pad but it felt like something else was on my skin. 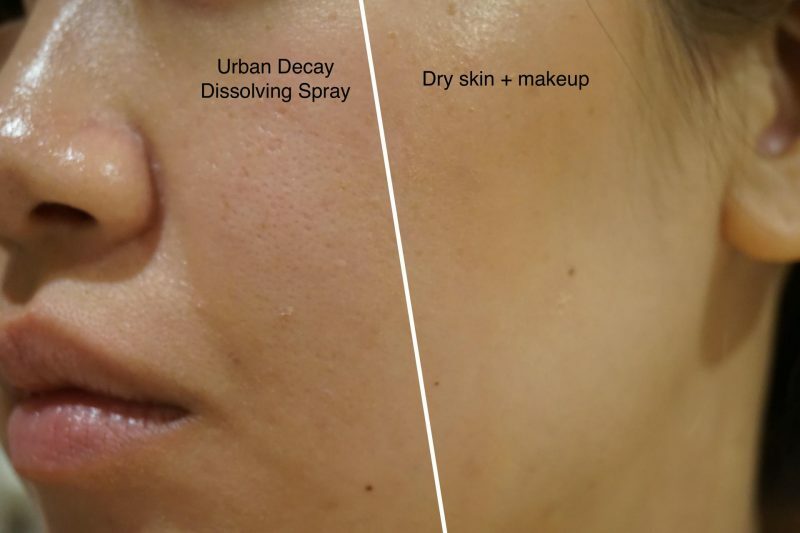 The Dissolving Spray leaves really greasy layer behind on my skin, which is the worst I’ve ever had! When you cleanse your face you expect a clean canvas, this was the opposite. My skin is combination/oily lately but when I used this spray my skin became even more oily and shiny than it already was. I had to use a second cleansing step to feel better again. The Cleansing Oil Stick is very new to me, I never used a cleansing stick before. 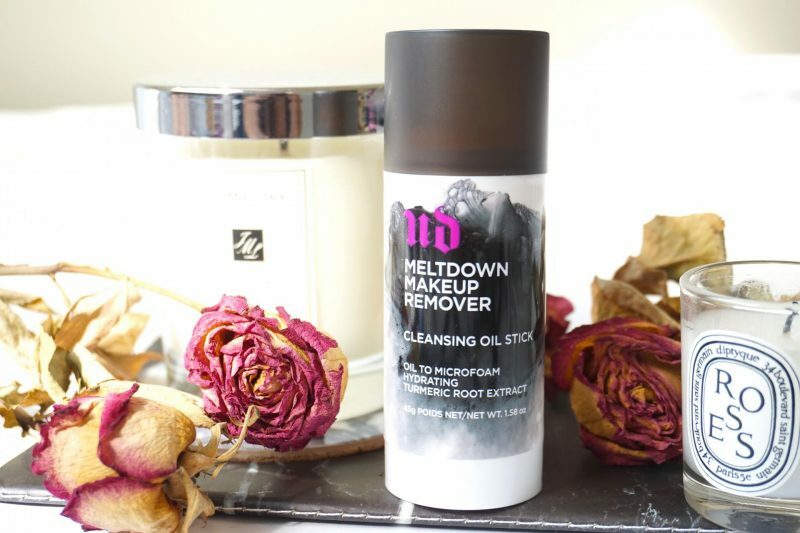 I do have my thoughts about using a cleansing stick direct on your skin because the next time you use it, you will literally re-apply the old makeup from the day before back on the skin. Did you also thought about the amount of dirt that will leave behind on the stick everything when you apply it on a face full of makeup? I had to wipe it off because my makeup started to dry on the stick itself. Okay, I have to stop about the hygienic part of this experience. The stick is easy to use: I just make few circles all over my face and it totally covered. With my hands I started to rub the balm into my skin to dissolve the makeup. It is so fast and easy to use! Did I already told you about the fragrance? Its smells amazingggggg. O em gee, get this stick because it smells better than a fragrance candle or perfume. I am not kidding. I will not explain how it smells because I’m the worst person in describing a specific scent. Just believe my word that this stick smell great and it easy to use. Skin feels super smooth afterwards and even nourished after just one use. This is something I’ve never used before. A special remover for the lips only. I do own a makeup remover on oil base that can be used for eyes and lips but in a liquid form. The oil stick is quick and easy, just apply 2 layers on the lips and wipe it away with a tissue or cotton pad. How hard does it have to be to remove your lipstick? Well, when you use a matte liquid lipstick that stays on like forever or when you used a lip stain that will get stuck between the lines. I used this on my lips which had multiple re-application layers, food, drinks and more food. What you see below is seriously just before I went to bed. This is 10-hours of lipstick with multiple layers. I applied two layers of the Oil Stick on my lips and it glides like a baby bump. This stick feels super smooth on my lips. The funny thing is that this Oil Stick can also be used as a lip balm but I would prefer a real balm instead of this intentionally lipstick remover. When I applied the stick I squeezed my lips a little bit to warm up the product. Grab a tissue or a cotton pad and swipe it over your mouth. I was surprised that so much product came of, as you can see. Only some leftovers between my lips which is the area with dry cracks. I just wiped it once and this is the difference! Urban Decay has their own cleansing range because how else do you remove your Naked eyeshadows are 24/7 Gel Liners? The least favorite product was the Dissolving Spray because it made my skin feels super oily and heave after I wiped it off with a cotton pad. I had to double cleanse my face afterwards to get rid of the heavy product feeling. The Dissolving Spray did removed my wakeup within seconds but I didn’t like the experience. My most favorite product is of course the Cleansing Oil Stick! The moment I applied the stick on my face it was like butter in a hot pan. It melts beautiful on my skin and with my fingers I massage it into the skin to dissolve the makeup. The scent that escaped when you open the stick can be described as a super luxurious perfume of €100,- (reminds me of a Jo Malone scent). The whole routine of applying it to removing the balm-to-oil with water is amazing. My skin feels super smooth, looks even and no makeup residue on my face. This is something everyone can use and will love! 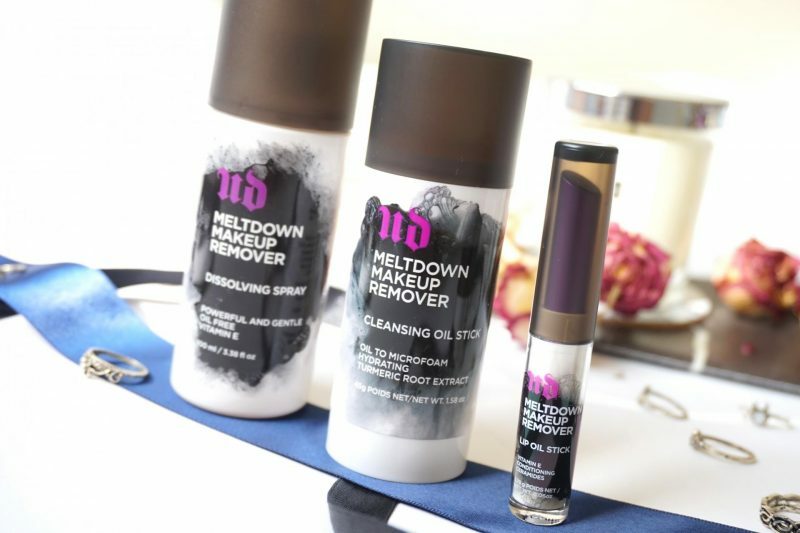 These items are available on the official Urban Decay Meltdown Makeup Remover website.